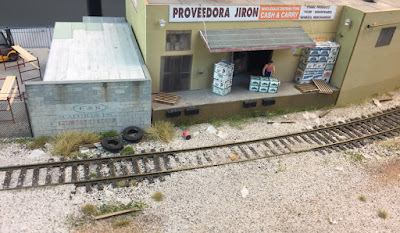 I had the opportunity to attend ProRail this year, held in Washington, D.C. over April 27–30, and was also able to join some “preview” sessions before the main event began. All those operating sessions, combined with open-house visits, meant that I saw a total of 13 layouts, and photographed them all. Obviously it is only practical to show a slender slice of all that, so I will just show arbitrarily selected examples, mostly because so many of the layouts were simply excellent. 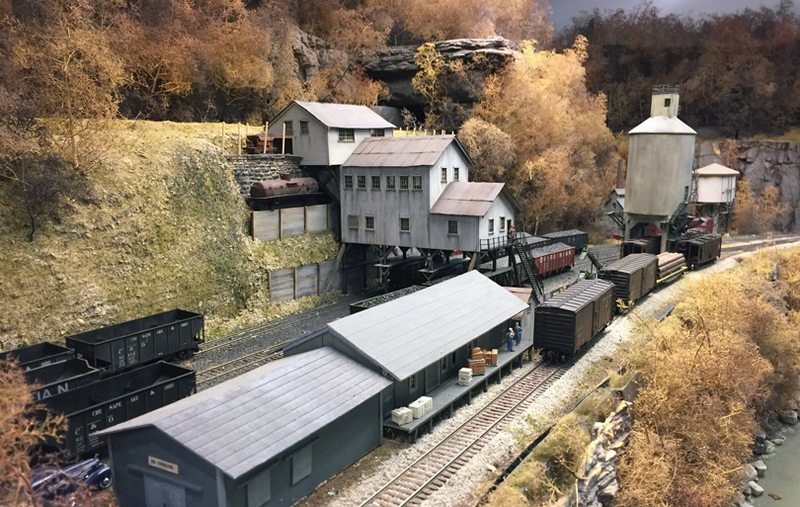 One of our preview sessions was Ted Pamperin’s outstanding C&O layout, set in the steam era. I have long respected Ted for the effort he has made toward prototype operations, but the chance to see and operate on his layout was a special treat. 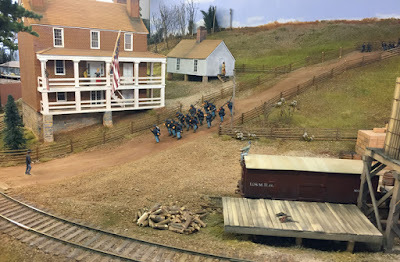 Here is just a single view of the scenery technique (the layout is set in November). 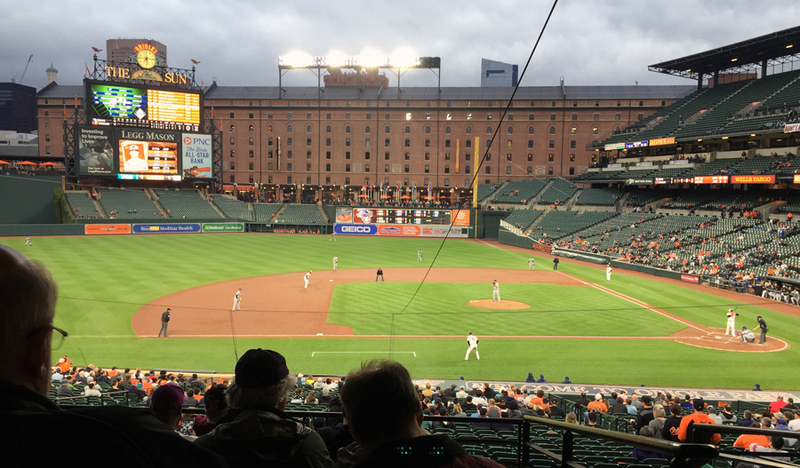 There is a long tradition among some who attend these ProRail events, of attending a professional baseball game in the area if possible. 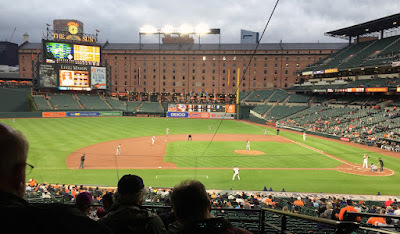 We chose to see the Baltimore Orioles play in their superb Camden Yards ballpark, just a lovely place to watch a game and, perchance, enjoy a ballpark hot dog. You can see that we had terrific seats, arranged by Bob Willer. A genuine highlight for me was operating on Paul Dolkos’s layout. 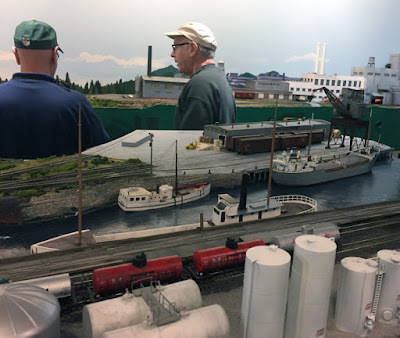 I have long admired his work, and had seen his B&M layout on a layout tour, but had neither seen nor operated on the Baltimore Harbor District he is still working on. Among his industries is Esskay Meats, which is still the brand of hot dog sold at Camden Yards! You can understand the trade name, incorporating the owners’ initials, when you recognize that the full name of the owners was Schluderberg and Kurdle. 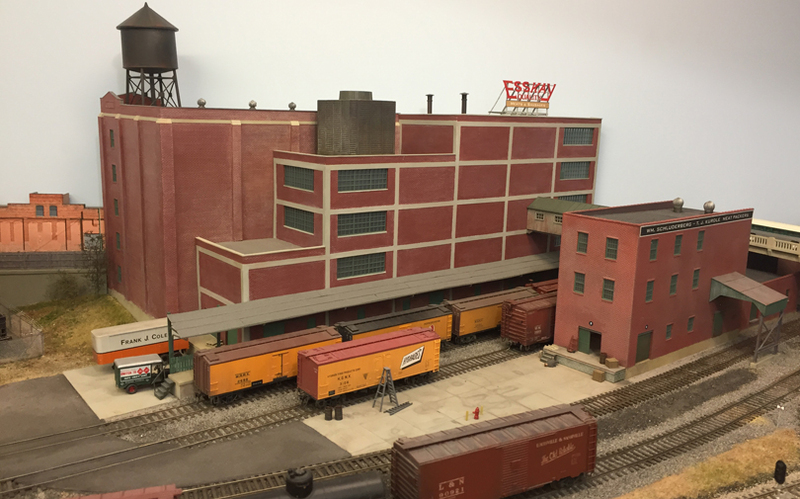 I also had the pleasure of operating on both of Bernie Kempinski’s layouts, his Civil War Aquia Line in O scale, and his HO scale Port of Los Angeles, set in 2016. As Bernie observed, when you step from one room to the other, there is a century and half between them. Here is just one of the diorama-quality scenes on the Aquia Line. Bernie had to scratchbuild all the rolling stock, along with buildings, track and scenery. During the open house tour, we were able to visit Lance Mindheim, something I have been wanting to do. His technique using photographs entirely as the basis for modern structures (literally gluing a photo of each building wall to a core) is most effective, as is his weeds, litter and trash. Not every era would have this kind of trash, of course, but on a modern layout it ought to be there. Lastly, I had the fine experience of seeing and operating on Mat Thompson’s beautiful Oregon Coast layout. My job was the industrial switching at Tillamook, paired with Ted Pamperin on the other side of town, and under the direction of Phil Monat as yardmaster. That’s Ted at left and Phil at right, with Tillamook Harbor piers in the foreground. A great job and a great way to wrap up the weekend. This was an outstanding ProRail, with terrific layouts and smoothly run events. I enjoyed the opportunity to be there and very much enjoyed a chance to operate on these fine layouts.